Jane Austen’s Pride and Prejudice has informed generations of readers, writers, and filmmakers, all of whom have devised their own reinterpretations of it. Author Sonali Dev is the latest in a long line of Austen fans to be inspired to create her own rendition of the beloved romantic classic, moving the pastoral romantic drama to contemporary California. In Pride, Prejudice and Other Flavours, the Bennet family is replaced by the Raje family, a wealthy immigrant family descended from Indian royalty and now poised to take over California politics. Like the Bennets, the Rajes are a tight and ambitious family unit. The patriarch of the family, Shree Hari Raje, affectionately called HRH (His Royal Highness), and the matriarch of the family, Mina Raje, a former Bollywood starlet, are protective and stern in the upbringing of their brood—four children, and two orphaned nieces. While the focus of the family is on the eldest child, Yash, who is beginning his gubernatorial campaign for California, Pride, Prejudice and Other Flavours follows the third sibling, Trisha Raje, a neurosurgeon at the head of her field, who is in the midst of making a massive breakthrough in tumour-removal technology. But it comes at a price. Trisha will be operating on Emma Caine, an upcoming British artist who ignored her tumour for too long, and though Trisha’s ground-breaking method will save Emma’s life, it will leave her blind. Not the best news for an artist. Trisha’s life is further complicated by Emma’s brother, DJ (Darcy James), who cooks the best food Trisha has ever eaten in her life, but who also absolutely hates her guts. Understandably so—Trisha isn’t the most sociable of people and is quick to put people back in their place. And DJ is easily swayed by his prejudices towards those more privileged and better off than him. But providence brings the two of them together—they both must work towards saving Emma’s life, and ensuring Yash’s campaign fund-raiser is a resounding success. On the way, they learn how to examine and question their pride and their prejudices, and find some common ground for an unlikely relationship. Pride, Prejudice and Other Flavours is anything but a simple story. It’s a combination of romance, drama, mystery, identity politics, racial tension, the culinary arts, and medical science—in other words, a reminder that romance novels written by women are complex and multi-layered. As someone who generally doesn’t read romance, I found myself captivated by this story from start to finish, and that mainly has to do with how well-structured this novel is. Through the dynamics and the inner workings of the Raje family, readers are given clues to important events in the past that inform the majority of the plot. It also helps place Trisha firmly as an outsider—thus making her the reader stand-in so we can learn about ‘her world’—and sets up the biggest mystery in the narrative. I like that Dev takes a long time to explain why and how things are the way they are. For instance, an incident involving someone named Julia comes up constantly—and is the primary reason for Trisha’s ostracization from the family—but it isn’t till nearly half-way through the book that we find out who she is and what Julia’s machinations will mean for the other characters. I really love the way the Julia incident ties into practically everything—from Yash’s campaign, to Emma’s health crisis, to Trisha’s feelings of self-worth—and I felt that by incorporating this element into the story, Dev elevated Pride, Prejudice and Other Flavours from just a romance story to something more deeply layered and engrossing. The science of the story—which Dev assures readers is fictional, but drawn from real science theory—is another aspect of Pride, Prejudice and Other Flavours that had me hooked. For one, the scientific terminology isn’t designed to alienate the reader, but to give them a better understanding of what Trisha is trying to do. But the science side of the story also clearly illustrates Trisha’s adoration for her job and her absolute assuredness in herself, both of which make her such an unusual protagonist in a genre that has often been criticized for its unrelatable characters. And making a character like Trisha, or any of the Rajes, relatable could not have been an easy task. The Rajes are literally royalty and extremely wealthy. Despite that, Dev writes them all as very human characters—they have flaws, but they are also extremely dedicated to doing good in the world. These are people who do not take their wealth lightly, but they do sometimes forget that just because someone isn’t working in their field, that doesn’t mean that they aren’t doing important work. It is these aspects of the characters, particularly Trisha’s, that informs the central conflict between Trisha and DJ. As in Pride and Prejudice, where Elizabeth Bennet was prejudiced against Darcy, a prideful and wealthy man, so is DJ prejudiced against the proud and unaware Trisha. I definitely appreciated Dev’s subversive gender-swap, not just in the case of Trisha and DJ, but also with Julia and Yash. Dev knows how to paint a picture with her words, brilliantly creating images of the family mansion in Sripore, and The Anchorage, the Rajes’ home in California. But, more than that, I loved the descriptions of food! They were evocative, beautiful, and so much fun, that I felt hungry all the while that I was immersed in the pages of Pride, Prejudice and Other Flavours. I honestly felt like this book could have done with more food. I can’t not mention the race relations, as that is also something Dev touches upon in this book. It is through DJ’s experiences as an Anglo-Indian-Rwandan that Pride, Prejudice and Other Flavours delves into the state of race relations in the world today. I was pleased that, despite the book being set in America, DJ wasn’t written as a white man. Instead, his mixed heritage, and the fact that he presents as British-African, make for a more complex dynamic between him and Trisha. Needless to say, I found myself enjoying this book immensely. It does start off slower than I expected it to, and I found the sudden introduction of DJ’s point of view some forty pages into the story a little jarring, but on the whole, this is an incredibly fun, and easy read. 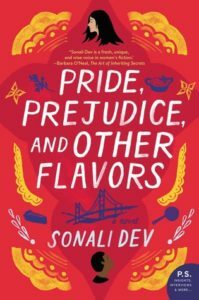 Pride, Prejudice and Other Flavours is an exciting new take on a classic tale, with interesting characters, a multi-faceted story, and a rich understanding of what makes people unique. This is definitely a book you will want to savour.